There are 7 stakes located in the North Carolina Charlotte Mission. A few Spanish-language congregations are also present. Several Church resources are located within the mission boundaries, including an LDS Family Services office is located in Charlotte, a Bishop’s Storehouse and Home Storage Center in Greensboro, and multiple FamilySearch Centers. 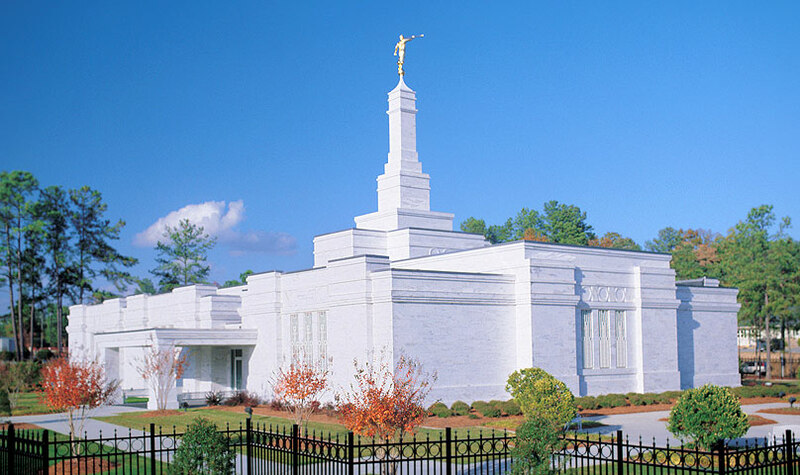 Stakes within the mission are assigned to either the Raleigh North Carolina Temple or the Columbia South Carolina Temple (both of which are outside mission boundaries). While typical American fare is present in North Carolina, there is more of an emphasis on Southern-style dishes such as fried chicken, biscuits and gravy, grits, and okra. Also popular in the Charlotte region is Lexington-style barbecue. This type of barbecue is made using pork shoulder to make pulled pork sandwiches that are topped with a vinegar- and tomato-based sauce. The sandwiches are often served with cole slaw as well. “Church barbecue” (or barbecued chicken) is also somewhat popular in western North Carolina. Biscuits and gravy, a popular dish. Like most stateside missions, missionaries will mostly use either cars or bikes in their areas. Designations are generally based on the size of the area and leadership positions. Charlotte also has an extensive public transportation system that includes a light rail and bus lines. Like any major metropolitan area, the Charlotte region has some areas that are not as safe for missionaries to visit. While most places are generally safe, missionaries should be aware of their surroundings and situation, especially while in the larger cities. The Charlotte area is home to some unique events such as the Carolina Renaissance Festival, which runs on weekends in October and November; as well as Food Truck Friday and Sizzlin’ Saturday – an evening event featuring live music and some of Charlotte’s best food truck vendors. With barbecue being so popular in the region, one of the area’s biggest events is the Lexington Barbecue Festival that is held each October in Lexington, NC. Hundreds of food vendors come to serve their barbecue dishes. Several other activities go on during the day as well, such as live music performances, and the “lumberjack games” that include contests such as axe throwing and chainsaw cutting contests. Charlotte is home to the Carolina Panthers of the NFL and the Charlotte Bobcats (soon to be Charlotte Hornets) of the NBA. Charlotte has plenty of other interesting sites as well, such as the NASCAR Hall of Fame and the Discovery Place Museum. Bank of America Stadium, home of the Carolina Panthers. Climate: All four summers are present in North Carolina. Summers are very hot and humid in North Carolina, with precipitation occurring fairly regularly. Despite its southern location, winters can still get very cold (in part due to the high humidity). However, sleet and ice are more common than snow. *What advice would you give to someone going to the North Carolina Charlotte Mission?